Thunderbird quit responding to my mouse, suddenly! Thunderbird has worked very well for me for weeks, although lately I've been getting a lot of interminable Unresponsive Script Notification windows. I've been taking advantage of Thunderbird's ability to have multiple tabs open, but have come to regret it. Last night I opened a second Inbox tab to try to have an Inbox sorted by name rather by time. (This is something I had done without incident several times previously.) Thunderbird became totally useless, went into full perversity mode. It complicated things for me by opening up a second window that I had not called for. It got into the syndrome I've seen much of lately on Firefox of immortal tabs, basically freezing in place on the opened tab, refusing to allow me to click it out or to use the context menu to close the tab out, and refusing to allow me to move to a different tab. I reinstalled Thundebird to try to drive out the perversity, but it did not fully work. Safe Mode didn't work either. Now there is not a single time that I bring it up without it flashing orange with the pestiferous unresponsive script notification. (That wasn't happening before recently.) And I wait a really long time before the unresponsive script window emerges so that I can click on it. 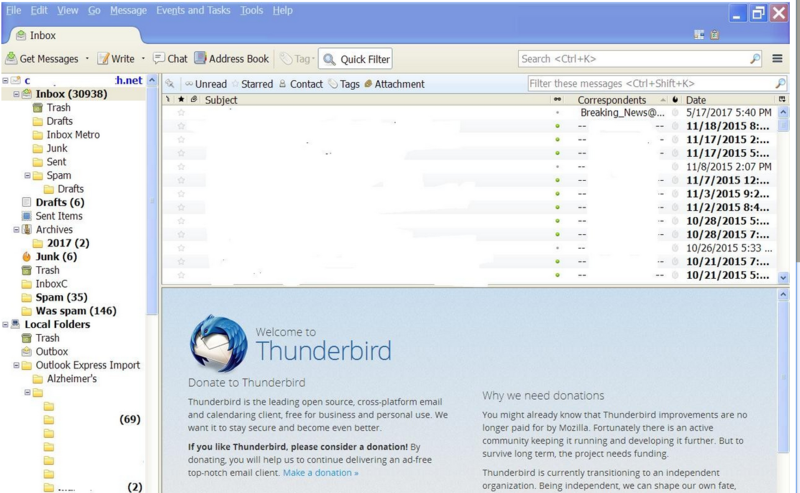 I have brought up Thunderbird repeatedly since the reinstall, and it has been unusable. When I click on an email in the list shown, it doesn't open the email. It refuses to click out a superfluous second tab. It refuses my clicking to a different folder. The thing won't even click out at the upper right corner. I have to kill it with Process Explorer. Where an opened email's contents should be showing it is instead showing a donation message, which I really think may be a big part of the problem. I wish I could disable the donation message. Thunderbird will scroll for me, but it will no longer do anything from my mouse, from clicking or the context menu. Last edited by LIMPET235 on June 1st, 2017, 8:53 am, edited 1 time in total. Thank you, LIMPET235. I don't understand. At the time all this happened the auto-updating on Thunderbird had me up to version 52.1.1. This download is for version 38.5. Can you explain? Well, thank you! I did that, and my Thunderbird is back to life! Please do explain to me what is going on. Hello. Please help me understand the situation with these different versions of Thunderbird so I can avoid falling into a pit like this again. I really thought I was going to have to abandon Thunderbird for another program. My Thunderbird says when I click "About" that I am "currently on the release update channel". What does that mean? Thunderbird autoupdated to 45 and then to 52.1.1, and I once again experienced unusability. I checked and saw that the Mozilla website is still offering 38.5. Why is there the discrepancy between the website and "the release update channel"? That's different from the current "release" version. You appear to be running XP, which complicates things. If you had XP SP3 (or a later version of Windows) the Mozilla web site would have provided the latest version. Since you didn't, the Mozilla web site provides version 38.5.0 and then lets you auto-upgrade to the latest release (52.1.1). This two step process is due to a new digital signing certificate for Windows builds added in version 38.5.1. I've read that its the installer that imposes the limitation so its not clear why the Softpedia setup program was immune, if you believe their claim they are unmodified copies of the original files. "release update channel" means you use the normal build. There are other channels for test releases such as beta, earlybird etc. If you had XP SP3 (or a later version of Windows) the Mozilla web site would have provided the latest version. I do have XP SP3. My Thunderbird has now upgraded to 45. I'm really worried about it upgrading to 52.1.1, because every time it has done that it has gone useless on me. Is 52.1.1 simply incompatible with XP? conceptualclarity1 wrote: I'm really worried about it upgrading to 52.1.1, because every time it has done that it has gone useless on me. Is 52.1.1 simply incompatible with XP?